What is the implication, the meaning, the reality of baptism, chrismation, membership in the Church? The definition of church membership is not something that we can read in the statutes. It is simply “to serve.” All are called to minister. The people of God are called to minister, not to be ministered to, but to minister. All are called to serve. It is not a question of the clergy serving the people but rather a call to service for all the people, including the clergy, who make up the Church. In the beginning of the Scriptures, in Exodus, God is choosing His people, laos theou. His people are called out from other peoples. He assigns the priestly functions to Aaron and the priesthood to the male members of Aaron’s family. But again, He chooses the priests out of the people, out of the serving people, out of His people whom He has called to do His work, His will, to fulfill His plan. Why does our Church seem so slow to grow? It is precisely because we never seem to get beyond ministering to our own people. Instead of ministering to them, we should be ministering with them, to make the Church grow, to extend its mission and work in this country and everywhere. I love the Pauline images of the Epistles when he talks about the people of God. He speaks so often in images of military service. He talks about marathons, running races, and, in several passages, images of the Olympics. And, in today’s terms, I think precisely in terms of football, baseball, marathons. Paul sees in the secular world images of the sacred. He doesn’t separate the sacred from the secular. He sees these images and he struggles, grapples, with them. The Epistles are so realistic for this very reason. When St. Paul speaks about the people of God, the ministry of the people of God, he means everybody who considers himself a member of the Church. In his military terms, he says that if, in the church militant, it is only the clergy who fulfill the function of the ministry of the Church, then it is like fighting a battle with only the generals. Can you imagine how foolish that would be? Of course, it might be a good way to stop all wars! But in the real world, such a situation would be unthinkable. And when it comes to the ministry of the Church, this is precisely where the action is - on the front-lines, in your homes and neighborhoods, at your jobs, in our country. These are the front lines. We cannot do the work of the Church without the troops, the fighters, without those who are trained for service, trained to be of service, trained to be loyal, trained to understand the principles and do something about them, to give their lives and their hearts. This is precisely what St. Paul is talking about and this is the approach to the ministries of the Church that we must take. St. Paul uses another image - that of running the race. What would happen at a marathon if only the coaches ran the race while everyone else stayed home and watched the television? This is exactly what we have allowed to happen in the Orthodox Church. The coaches run the race. Everyone else attends. We attend services, we attend classes. We attend. We advise the priest, at best, at parish council meetings, when in fact, we should be expected to run the race with the coaches. The coaches can run alongside us, with us, but not for us. Priests can help with the training, they can facilitate, but it is ultimately up to each member to run the race. It’s the front line that moves the ball, you see, and that quarterback, that priest, that bishop, isn’t going to be able to do anything without the front line. He’s going to get sacked every time unless he has the front line working with him, for him, understanding the game and doing something about it. This was a revelation for me. All the time I sat there with the other laymen, listening to Howard Cosell talking, and waiting for something spectacular to happen in the backfield. Then, your son plays football, and this insight comes as you watch him play. You begin to see all kinds of fantastic things open up. You begin to see what happens when the line holds, when the line gives, what happens when someone goofs, what happens when there isn’t that team spirit and they don’t work together. Then you begin to see the injuries. You see what happens to the receivers and to that quarterback when there’s no line. The ball doesn’t move. This is what St. Paul is talking about when he speaks about all of us being committed to moving the Church forward. The bottom line is that we don’t want another generation of Howard Cosells to talk football. I’m so tired of hearing explanations about this or that - or giving explanations. Let’s train people to help instead of talking the game, talking about missions or church schools. Let’s learn the skills so that we can teach others in order to make the Church grow, so that it might be the extension of power, grace, love and fullness that it is called to be in this country. What I have in mind is power, people-power - not programs, not even materials - but rather people-power, power of the laos, the lay people. This is where our strength is. “Lay ministries” is getting back to the basics of equipping all believers, all the faithful, to use their gifts and talents for the work of the Church; that is, not to attend services, but to be of service, to be the servers, the ministers. In the sacraments, all Christians are addressed by one word - “servant” and this implies that no one may contract out of rendering service to Christ and His Church. And, how are we known in the Church? Is there a single sacrament in which we are referred to in the abstract? Each and every time, the commitment is personal - Mary, John, Andrew - every name. We are known personally. But are we simply called by name? Always, we are identified as the servant of God, Mary, the servantof God, Andrew, the servant of God, Ann, the servant of God. Are these just vain words, or some sort of wonderful, mystical connection to the glorious Byzantine past? No, indeed! There’s not a single word in the services that we shouldn’t take seriously. And, if the priest or bishop refers to us as “the servant of God,” we’d better believe it! That’s what we’re called to be, what we’re called to do - to be the servant of God, to be the servant of the parish, to be the servant of the diocese - the servant of God and specifically, by name. This is what ministries is all about. In communion itself, koinonia, the fellowship and nourishment in which we ourselves partake of the Divine Light in the Precious Body and Blood of Our Lord and God and Savior, Jesus Christ, we are addressed as “the servant of God.” Is this simply for our own spiritual service? Do we think that just because it is spiritual; it cannot be selfish? I have seen too much spiritual selfishness in my lifetime. We receive Christ here in the Holy Gifts precisely so that we can say to our neighbor, even to our enemy, “Jesus in me loves you.” I have no business holding grudges because I have partaken of forgiveness itself, of divinity itself. Now I must serve. I must serve love. I must serve the divine so that what Jesus is by nature I might be by grace. Marriage itself is meant to serve as a ministry of Christian witness. This is the reason for the martyrs’ crowns. Our home must be part of this ministry, this witness in the neighborhood, in the community. This is where it begins and where it grows - in the home, in the family, among relatives and friends, in our places of our work and lives, we are married to each other as “the servants of God.” How quickly romance will fail unless Christ Himself is involved, unless our love is service whose purpose is being the means by which we are given to each other, to love each other, and to fulfill that love by which we have been bound to Christ. Ordination is simply an extension of our family into the world, and this is why the Orthodox Church doesn’t ordain just celibates. This ordination, as every priest knows, is a martyr’s crown, just as life is for all of us. Finally, even in the anointing of Holy Unction, there is service rendered. 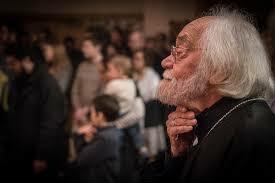 The sacrament is not simply to pray for some kind of miraculous healing but to realize that the ultimate healing is that the servant of God is anointed, so that even in sickness, old age, even dying, there might be the service rendered - a service of courage, faith, and hope. It is also a service of rejoicing for all that we have shared, all that we can expect, all that we have received out of God’s abundant love. And, for those who render this service to the Lord, we cannot even imagine the beauty and rejoicing that comes to those who love Jesus. Baptism, chrismation, and all those other sacraments, are meant to prepare us for ministering, for our ministries in this world. And in these ministries, we are called to act as the equals of God. We talk so often about being baptized into Christ’s life, of being chrismated by the Holy Spirit, of being enabled to live this life. We talk about Christ’s fasting after His baptism, and we say that we ourselves now fast in imitation of Him. We fast in preparation for Pascha, in preparation for the Theophany, to honor the Apostles and the Theotokos. But, there is still another aspect of these events in Our Lord’s life. Why was He baptized? That we might enter into His baptism and life. Why did He fast? So that He might share with us all those things by which we as humans are tempted. St. Paul says in Hebrews, “...one who in every respect has been tempted as we are, yet without sin.” (Hebrews 4:14). And so, we are baptized and we fast. But what did Our Lord do after this? He began His ministry. All the events that went before were to prepare Him for His ministry. Now, who is supposed to continue this earthly ministry? Why, in His prayer for His Church (John 17) does Christ say, “I do not pray that thou shouldst take them out of the world, but that thou shouldst keep them from evil.” “As thou didst send me into the world, so I have sent them into the world.” We remain in the world. Why? In order to do what? In order to continue Christ’s ministry in His Body, the Church. All are called to this ministry of service. We are not called simply to fulfill the fast and then to say, “Oh, good, Christ is risen!” or “Christ is born!” Our fasting must lead us, prepare us, again and again, reinforce in us again and again, our calling to minister. And what was this ministry of Our Lord’s? To teach, to preach, and to heal. If our lives do not teach, preach, heal by our example, then we are no Christians at all! Teaching does not mean “to explain” the way we explain icons. We are called to beicons! Do you realize that if an icon doesn’t teach, preach, or heal, then it isn’t an icon, either? It is the same thing with us. That we are to teach does not mean “to explain” or “to talk about” but rather to be the followers of Christ, to be the doers of Christ. Our preaching is precisely to reflect in ourselves this message of salvation. And healing, St. Peter speaks of as the love that covers a multitude of sins. Because we have been loved first, we are given this ministry of love by which we are enabled to love others and to heal, to be the balm of Gilead in the lives of others, in their loneliness, in their separations, in their aches and despair. In order to teach, preach and heal, the ministry of stewardship is crucial. We must learn how to manage our lives since there is never enough time, money, and resources to do everything that we are called to do in this overwhelming task for the growth and evangelization of the Orthodox Church in America. Without the stewardship and management of our priorities and our resources, we will make very little progress. Galatians 6:14-15 “But far be it from me to glory except in the cross of our Lord Jesus Christ, by which the world has been crucified to me, and I to the world. For neither circumcision counts for anything, nor uncircumcision, but a new creation.” A new creation, a new humanity, and this new humanity is recognized, is manifested by our behavior, by what we do, by what our goals are, not by our talk. Philippians 2:5-8 “Have this mind among yourselves, which is yours in Christ Jesus, who, though he was in the form of God, did not count equality with God a thing to be grasped, but emptied himself, taking the form of a servant, being born in the likeness of men. And being found in human form, He humbled himself and became obedient unto death, even death on a cross.” We read in this passage, and in the Liturgy of St. Basil, that He lowered Himself to the likeness of a servant so that in our serving, we might liken ourselves to His glory - doxa. Hopefully, it will be the right glory - orthdoxa. I Peter 4:8-11 “Above all hold unfailing your love for one another, since love covers a multitude of sins. Practice hospitality ungrudgingly to one another. As each has received a gift, employ it for one another, as good stewards of God’s varied Grace: whoever speaks, as one who utters oracles of God; whoever renders service, as one who renders it by the strength which God supplies; in order that in everything God may be glorified through Jesus Christ. To Him belong glory and dominion forever and ever. Amen. 1986 Fr. Sergei Glagolev is retired. He continues to lecture at St. Vladimir’s and St. Tikhon’s Seminaries. Dr. Michael T. lrvin is Headmaster of Harbor Country Day School, St. James, N.Y., and is a member of St. Andrew’s Parish, Dix Hills, N.Y.